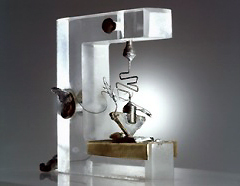 This timeline features Premodern example of nanotechnology, as well as Modern Era discoveries and milestones in the field of nanotechnology. 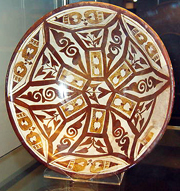 Early examples of nanostructured materials were based on craftsmen’s empirical understanding and manipulation of materials. 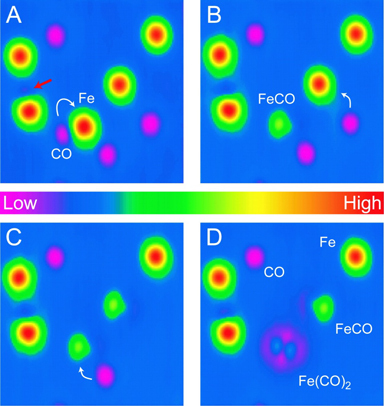 Use of high heat was one common step in their processes to produce these materials with novel properties. (Left) A Damascus saber (photo by Tina Fineberg for The New York Times). 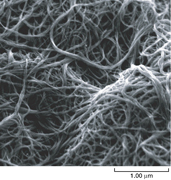 (Right) High-resolution transmission electron microscopy image of carbon nanotubes in a genuine Damascus sabre after dissolution in hydrochloric acid, showing remnants of cementite nanowires encapsulated by carbon nanotubes (scale bar, 5 nm) (M. Reibold, P. Paufler, A. 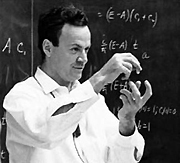 A. Levin, W. Kochmann, N. Pätzke & D. C. Meyer, Nature 444, 286, 2006). 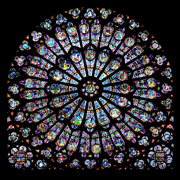 These are based on increasingly sophisticated scientific understanding and instrumentation, as well as experimentation. 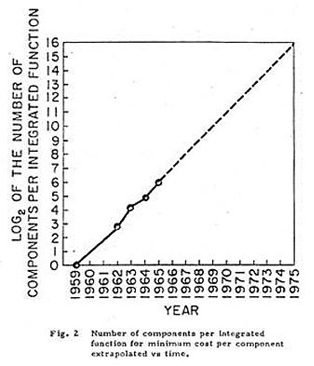 Moore's first public graph showing his vision of the semiconductor industry being able to "cram more components onto integrated circuits"
1990s: Early nanotechnology companies began to operate, e.g., Nanophase Technologies in 1989, Helix Energy Solutions Group in 1990, Zyvex in 1997, Nano-Tex in 1998…. 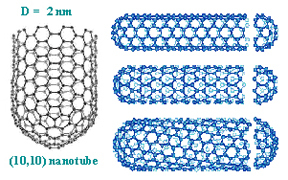 Carbon nanotubes (courtesy, National Science Foundation). 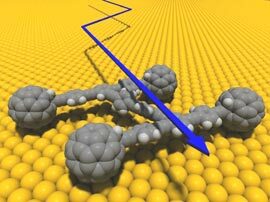 The properties of CNTs are being explored for applications in electronics, photonics, multifunctional fabrics, biology (e.g., as a scaffold to grow bone cells), and communications. 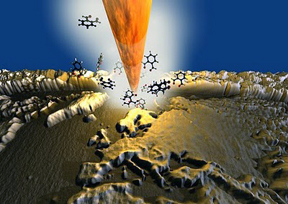 See a 2009 Discovery Magazine article for other examples SEM micrograph of purified nanotube "paper" in which the nanotubes are the fibers (scale bar, 0.001 mm) (courtesy, NASA). 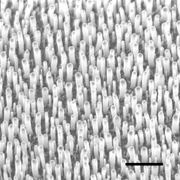 An array of aligned carbon nanotubes, which can act like a radio antenna for detecting light at visible wave- lengths (scale bar 0.001 mm) (courtesy, K. Kempa, Boston College). 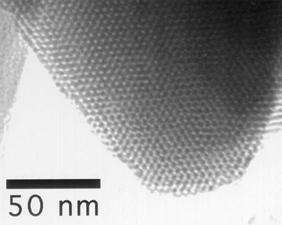 MCM-41 is a "mesoporous molecular sieve" silica nanomaterial with a hexagonal or "honeycomb" arrangement of its straight cylindrical pores, as shown in this TEM image (courtesy of Thomas Pauly, Michigan State University). 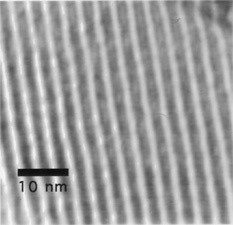 This TEM image of MCM-41 looks at the straight cylindrical pores as they lie perpendicular to the viewing axis (courtesy of Thomas Pauly, Michigan State University). 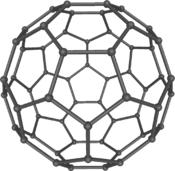 Nanocar with turning buckyball wheels (credit: RSC, 29 March 2006). 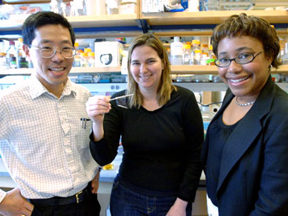 2012: The NNI launched two more Nanotechnology Signature Initiatives (NSIs)--Nanosensors and the Nanotechnology Knowledge Infrastructure (NKI)--bringing the total to five NSIs. -The NNI starts the next round of Strategic Planning, starting with the Stakeholder Workshop. 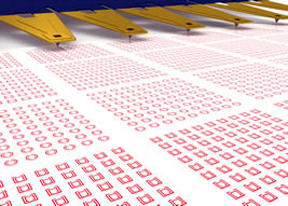 -Stanford researchers develop the first carbon nanotube computer. -The NNI releases the updated 2014 Strategic Plan. -The NNI releases the 2014 Progress Review on the Coordinated Implementation of the NNI 2011 Environmental, Health, and Safety Research Strategy.